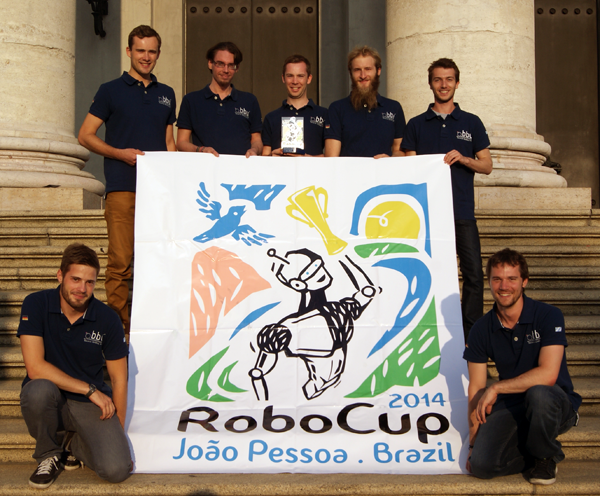 Runner-up World Champion at RoboCup 2014 in João Pessoa, Brazil ! We just became runner-up world champion in the Logistics League of the international RoboCup 2014 event in João Pessoa, Brazil! The RoboCup started on 19th July with two initial setup days in which we assembled, calibrated and tested our three Robotino 3 robots on the large field. On 21st July the competition started with the first round: 10 teams from all over the world (Brazil, Japan, Germany, Egypt, Mexico, Switzerland, France) separated into two groups played against each other to qualify for the playoffs, to which the first three teams of both groups were invited. Despite still facing and investing a lot of work in adapting our system from Robotino 2 to the new Robotino 3 hardware this year, we were able to win almost all games within the qualification phase and could easily move on to the playoffs. The six remaining teams now competed against each other to reach the finals. Our team, the Bavarian Bending Units, won 4 out of 5 games, losing only one game against Carologistics, which might have been the most attractive game within this league so far with three autonomous robots from each team efficiently collaborating together, producing products and avoiding each other all game long. During the playoff phase, we could further optimize our software and fix most of the bugs related to the new conditions mostly concerning our new hardware and collision avoidance. Due to the success within the playoffs we qualified for the finals on 24th July against Carologistics, which we faced before. Even though we further optimized and speeded up our production, during the first minutes of the game, we had to take out one robot due to hardware or localization problems, which resulted in us only competing with two robots against three robots from Carologistics. Despite this drawback, we were able to gain 124 points but lost the finals against a very strong opponent Carologistics from Aachen who collected 165 points. Congratulations to them! For next year the Logistics League will replace the signal machines by actual modular production systems (MPS) and work pieces both provided by Festo, pushing the league further towards real industrial scenarios. We look forward to contributing and participating to the new developments of this young league. In conjunction with RoboCup 2014 an international symposium took place on 25 July, where latest scientific results mainly in the fields of Robotics and Artificial Intelligence related to all RoboCup divisions were shared. This year Roodney Brooks, emeritus professor of the MIT, and Sami Haddadin, professor of the Leibniz university in Hannover, were invited to give a talk about their visions and current research topics. To conclude, we really want to thank all our financial supporters who made our participation at RoboCup in Brazil possible: the chair Robotics and Embedded Systems (Prof. Knoll) and the Department of Informatics at Technische Universität München (TUM), and the German Aerospace Center (DLR) with the Institute of Robotics and Mechatronics (Perception and Cognition, Dr.-Ing. Suppa). Also, we would like to thank Festo for their commitment to the Logistics League, all our supporters and all the other teams who made this event an exciting, interesting but also entertaining experience. 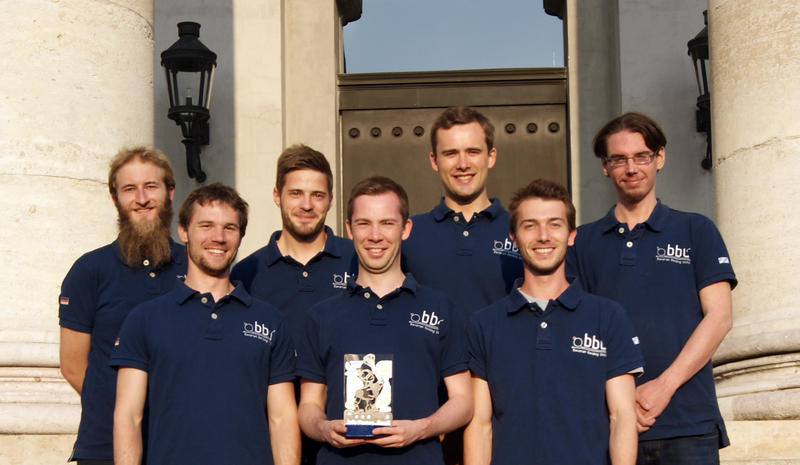 Last but not least, take a look at our media section to find photos and videos of RoboCup 2014 Logistics League!